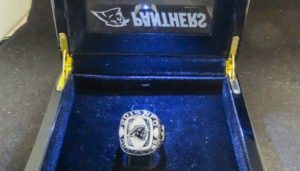 You now have the chance to own one of the most significant pieces of Carolina Panthers’ history – an official player-issued NFC Championship ring from when the Panthers went to Superbowl 50. San Diego jeweler David Levi & Sons just listed Chris Scott’s (#79) NFC Championship ring for sale for a ‘Buy It Now’ price of $27,500. This is the first official Panthers Championship ring that’s being sold to the public. Crafted in 10-karat white gold, the ring features a custom-cut aquamarine stone and 77 diamonds with a total weight of 1.35 carats. The ring top features the Panthers logo embedded on a football made up of pave-set diamonds, set atop the custom-cut aquamarine stone. Two marquis-cut diamonds represent the team’s two NFC titles, and the words 2015 NFC CHAMPIONS adorn the top and bottom of the ring. 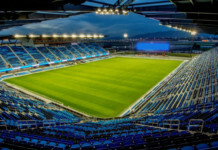 One side of the ring features the player’s name above a 3D depiction of the team’s home stadium. The player’s number is adorned with round diamonds and sits below the stadium. The other side features the Panthers team motto KEEP POUNDING above an image of the NFC Championship Trophy which is accented with two-tone 10-karat yellow gold to match the Super Bowl 50 logo. The team’s season record of 17-2 sits below the trophy. The inside of the ring features the Super Bowl 50 logo set alongside the words CAROLINA PANTHERS 10-0 AT HOME, 15-1 SEASON. Scott’s ring is a size 16 and weighs a total of 60 grams. 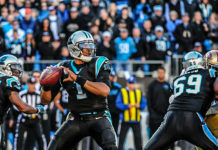 The former Offensive Guard was released by the Panthers in 2017 and was signed and released by the Giants in 2018. If $27,500 is a little too pricey, you can also buy an NFC Championship Cam Newton replica ring for $129.95 here.